How to connect Weather Display to YoWindow? Make sure the latest version of YoWindow is installed on your computer. You can download it from our site. YoWindow can read the weather from Weather Display through a file, composed in a special format - YoWindow weather file (yowindow.xml). You need to set up Weather Display to generate yowindow.xml using a template. 1. Click on this link to customyowindow.txt and save a copy of it to your C:\wdisplay\webfiles folder. 2. Open that file in notepad and read the comments at the top of the file. If you have no solar/UV sensors or are not manually inputting snow, remove those sections and save the file. Next you need to set up yowindow.xml generation. 3. Go "Setup - YOWindow Setup - Create yowindow.xml in webfiles folder" and click Yes. 4. Go "Setup - YOWindow Setup - Upload to Web Site" and click Yes if you wish to have the web widget on your site, otherwise No..
5. Go "Setup - YOWindow Setup - Use custom template (customyowindow.txt in webfiles) " and click Yes. With these settings Weather Display will start to generate yowindow.xml file every 5 minutes in your C:\wdisplay\webfiles folder. Check this folder to make sure yowindow.xml is generated properly. You can open yowindow.xml to look at its contents by double-clicking it, which will normally run in the web browser. 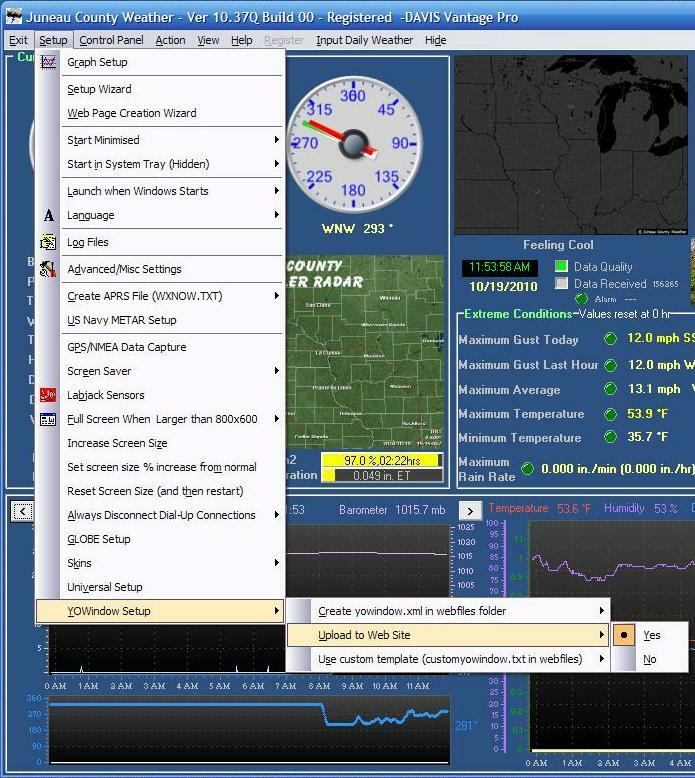 If you find the characters &deg; in your temperature or wind direction, in WD go to Control Panel - Web Files/Web Page Setup, then the Custom Web Page Setup tab. If the third item down "Include Units Used" is ticked, un-tick that. The final step - let YoWindow know yowindow.xml location. 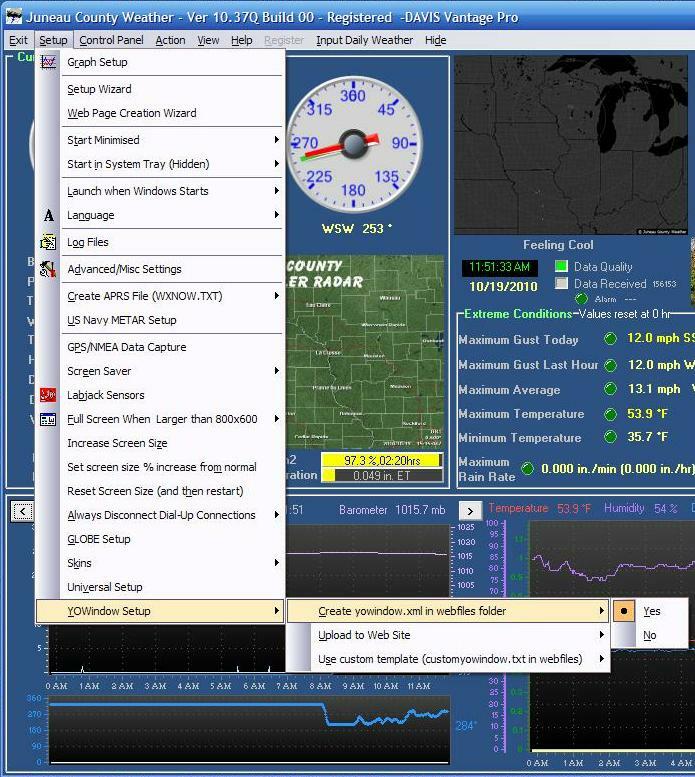 Follow these steps: "Personal weather station (PWS) setup"
4. Add YoWindow to your website or blog. YoWindow is not only a desktop weather station. You can add YoWindow to your webpage! Here we will explain how to set up YoWindow weather widget for your webpage and connect it to your Weather Display generated data. Add the widget to your web-page. 1. Setup YoWindow widget on this page. 2. Add widget HTML code to your webpage. 3. Upload the page to the server. 4. Make sure the widget is running on your page as expected. Connect widget and Weather Display. IMPORTANT: Make sure you have an access to your website ROOT directory. If you don't - you will not be able to connect Weather Display and YoWindow widget. 1. Set up Weather Display to upload yowindow.xml to your webserver (step 4 above). 2. To make YoWindow widget load current weather from yowindow.xml follow these steps. You can reflect the actual view from your window on your webpage or blog. To make YoWindow widget reflect the view out of your window follow the steps. 1. Take a picture out of your window. 2. Create YoWindow landscape from your picture by following our tutorial. 3. Upload the landscape to your webserver and open it inside the widget. Follow the steps.